Foreign Accent Syndrome (FAS) is rare speech disorder that affects about 80 persons in all the world, it´s a rare speech disorder characterized by segmental (abnormality in time of pronunciation of vocal and consonant) and prosodical deficits (abnormality in rhythm and intonation of words and phrases) without abnormal grammatical abnormalities, the patient´s speech resembles a nonnative accent. The most of cases present like an acquired abnormality of the speech due to a damage of the central nervous system. It could be secondary to neurologic or psychogenic disturbances. We present a case of FAS. It was a 65 years old woman with diagnosis of Multiple Sclerosis. Neurophysiological and Image tests were done to her. Visual Evoked Potential showed abnormality of nerve conduction on visual system due to demyelinating, Somatosensory Evoked Potential showed abnormality of nerve conduction on somatosensory way at left parietal area, probably due to demyelinating. EEG revealed paroxysmal activity on bilateral Fronto-Centro-Temporal regions, a peak of energy on theta band in all of derivation, predominantly in lower Frontal and Temporal regions and increase of absolute and relative power as well as mean frequency of theta band on lower Frontal and Temporal regions. 3T MRI showed hyperintense yuxtaxial image in cortical regions, hypointense images in brain stem, demyelinating plaques on left Frontal, Parietal and Temporal subcortical areas and in periventricular regions. 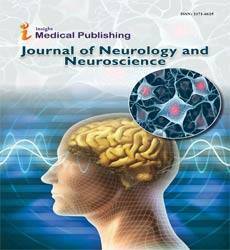 We conclude that FAS is a rare disorder, it could be associated to Multiple Sclerosis.